Twenty-month-old Bhutanese twins Nima and Dawa are still on their way home to Bhutan to be reunited with their father months after arriving in Australia. Separated Bhutanese twins Nima and Dawa are going home after a five-month stint and life-changing surgery in Australia. ▶ Videos for "Nima And Dawa"
Doctors say the conjoined twins who were successfully separated after a six-hour operation last week are "happy, clapping, laughing, smiling at us all and at times telling us to go away when they've..
Conjoined twin girls were successfully separated after a six-hour operation at the Royal Children's Hospital in Australia. Nima and Dawa traveled from South Asia with their mom for treatment last..
Conjoined toddlers Nima and Dawa traveled from their home in the Himalayas with their mother to the Royal Children's Hospital in Australia, where doctors hope to separate them. A non-profit called.. Formerly conjoined twins Nima and Dawa are ready to head home to Bhutan in coming days, some four months after separation surgery. 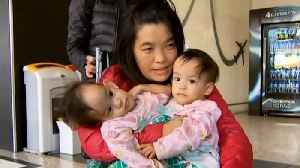 Former conjoined twins Nima and Dawa are due to jet home to Bhutan within weeks, just three months after delicate separation surgery. Former conjoined Bhutanese twins Nima and Dawa are due to jet home within weeks, just three months after delicate separation surgery. Former conjoined twins Nima and Dawa, separated during delicate surgery in Melbourne, are only weeks away from heading home to Bhutan. Bhutanese twins Nima and Dawa have appeared in in public as separated girls after leaving a leading Melbourne pediatric hospital on Monday. Separated Bhutanese twins Nima and Dawa will take their first steps in public as individual girls as they leave a Melbourne hospital where their lives were changed. Bhutanese twins Nima and Dawa will take their first steps in public as separated girls when they leave a leading Melbourne pediatric hospital on Monday. Separated Bhutanese twins Nima and Dawa will take their first steps in public when they leave a leading Melbourne paediatric hospital later on Monday. One of the surgeons who separated Bhutanese twins Nima and Dawa is expected to give an update on the girls' condition. The first time Bhumchu Zangmo laid eyes on her twin daughters Nima and Dawa after their surgical separation, she couldn’t tell them apart. Bhutanese twins Nima and Dawa have been lying together in a Melbourne hospital bed, tugging at each other and clapping days after their separation surgery. Melbourne's Royal Childrens' Hospital says Bhutanese separated twins Nima and Dawa are in a stable condition as they begin their lives as independent girls. Bhutanese twins Nima and Dawa can now begin their lives as independent young girls after successful surgery to separate the 15-month-olds joined at the torso. Bhutanese twins are in recovery after a successful operation to separate them. Coinjoined twins Nima and Dawa have entered the operating theatre for separation surgery, with the surgeon in charge feeling confident everything is in place.